Here are those who responded that they believed Christ’s command to “resist not evil” and were ready to commit to and teach this Bible truth back in their churches. Three days on a difficult journey to be with us at this MTM Bible Conference in Yangon. Humbling? The word is inadequate to describe how we felt when meeting these brothers. Missionaries cannot travel to their land, and so they came to us. Along with a number of local pastors and believers, they came to hear and to learn, that they too might teach. Brother Merle Flory taught a series on the Commandments of Christ and I gave a series on the Marks of a Disciple. The Mark of the Cross…deny yourself, take up your cross and follow me…And whosoever doth not bear his cross, and come after me, cannot be my disciple, Luke 14:27. It was a blessing to see the willingness of these pastors to embrace biblical teaching. Most had never heard of the Two Kingdoms. One pastor from Chin State told me…”I have heard many teachers but never teaching like this that shows how the gospel is to be lived”. What are the challenges to following Christ, Merle asked in one session…”Discrimination, no one will hire, the beatings, the stoning”. Truly the world is not worthy of such faithfulness and we were humbled. Full conference photo of men and women, along with the MTM team. L-R, Merle & Judy Flory, Nicole & Rich Moore, Shanae, Trevin and Hayden. The conference was organized by Pastor Toe and he was a model of organization, hospitality, and humility as he and his family graciously gave of themselves to host the conference. An added blessing was a brief presentation given by the Myanmar facilitator of a savings group. What a blessing for Nicole and I and our family to spend this week with Merle and Judy, learning to know these believers in another corner of God’s Kingdom. It was hard to leave. They gave us all precious gifts to remember them by. We return home with far more than we brought. The memory of a special week, brothers and sisters who are now close to our heart, and the hope of seeing them again someday; if not in this life, for sure, in the next. The twelve disciples from Chin State will soon begin the long journey home, by bus, boat and motor bike and just like the 12 disciples 2,000 years ago, we know that Jesus will be with them. The above article was written by Bro. Rich Moore from Dallas, OR. Rich serves as a minister in his home church. MTM is very grateful for their willingness to serve Christ in SE Asia. A Big Thank You to God, the Moore’s, and all who support this ministry, “for we are labourers together with God”. 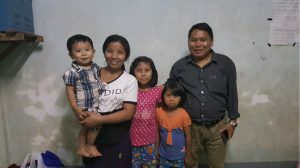 Pastor Toe, his wife and three children. 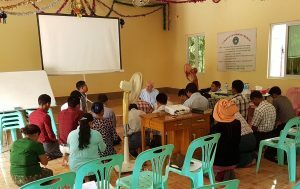 Following is a Letter of testimony about the MTM Yangon 2019 Leadership Conference, written by Pastor Toe, our Burmese coordinator. First of all, I am so grateful to God who gave me opportunity to meet you so that we could run MTM conference at my church in Yangon, Myanmar, and secondly, I would like to say thank you to MTM for accepting my request to run the conference at my church and for providing the fund for the conference expenses. I thank God for the impact on the attendees. There were 36 attendees. 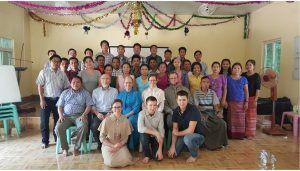 11 people from six different towns and villages of Southern Chin state and the rest are from Yangon region but they were from different churches and from different places. As I heard their testimony every night when we had night service during the conference week, I am sure they have learned so much from the conference. I strongly believe their life will be different as they go back and will impact their communities. So, the impact is amazing and high because of this conference. My church and my people in Myanmar are so blessed through you and this MTM conference. I myself have learned the important lessons from you and I am so blessed by your teaching. So, I am so grateful to you and to all the members of MTM for this conference. I really appreciate what you did for us. 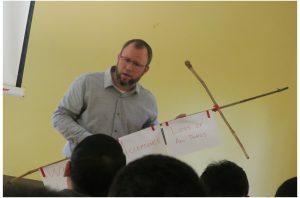 If Lord willing, I want you to run MTM conference somewhere in Myanmar again in the near future. Let us pray and plan together for next MTM conference in suitable places in Myanmar. God bless you and all the MTM people for his kingdom sake. CLICK HERE TO VIEW THIS PHOTO ALBUM! !